Busselton house design for a Perth based builder seeking a south west sea change. This architect created Busselton house design for a Perth based builder seeking a south west sea change ‘to live the dream’ and a thermally efficient passive house achieves a modest three bedroom residence with 188 sqm of sun drenched ground floor living area and 32 sqm of alfresco and terrace – ensuring optimum performance as a passive house. 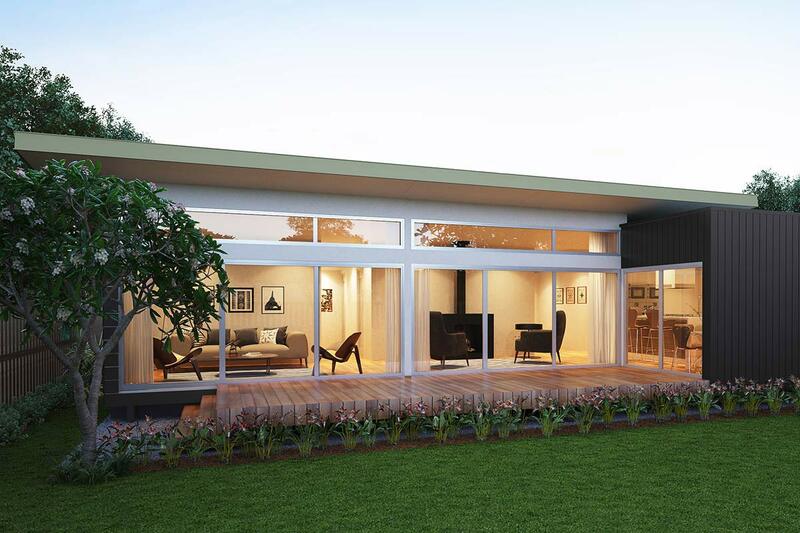 The Busselton house design maximises the tight site and is ideal for short term stay accommodation with the Busselton house design’s efficient planning and patented prefab footing system. The Busselton house design strategically locates the generous open plan living areas, separated from the alfresco by large 2400mm high clear anodised end-sliding doors, to the northern portion of the site. The Busselton house design’s living spaces therefore access the northern aspect which is integral to perform well as a passive house – the northern living space spills out onto the alfresco and embodies indoor-outdoor living and the south-west summer lifestyle sought after by holiday makers. The Busselton house design is built on a modest budget using a patented prefab footing system but still incorporates other sound eco concepts such as solar hot water, wood fuel firebox and wood boosting to further validate this passive house’s green credentials. Visitors to the passive house are greeted with a large 2400mm high double glazed timber pivot door and are only then ushered into the passive house’s open plan living areas. The architect designed kitchen incorporates the latest porcelain panel selections with a 1200mm wide kitchen island bench that maximises interface between the kitchen hub and adjacent living area. The Busselton house design features kitchen perimeter benchtops in the passive house also boast the latest porcelain panel selections, coloured back glass and Blum Adventos lift overhead cupboards cantilevered above the benchtop height slot window. The Busselton house design material palette also includes clear anodised window frames, porcelain panel kitchen benchtops, Arte Domus tiles, Australian hardwood internal timber flooring and Sikkens paint finish decking. The wall cladding material finishes for this Busselton house design combine horizontally formatted James Hardie Scyon Linea weatherboard and vertically grooved Scyon Axon cladding, for a higher BAL rating, and to ensure the passive house met the tight project budget.